Like the savory, simple dishes she favored, M. F. K. Fisher's writing was often “short, stylish, concentrated in flavor, and varied in form,” writes Joan Reardon in her introduction to this eclectic, lively collection. Magazine writing launched and helped to sustain Fisher's long, illustrious career, and in these 57 pieces, we experience again the inimitable voice of the woman widely known to have elevated food writing to a literary art. This book covers five decades of Fisher's writing for such notable and diverse publications as Gourmet, Bon Appétit, Ladies' Home Journal, Atlantic Monthly, Harper's Bazaar, the New York Times, the New Yorker, and Vogue. But collected here also are articles nearly impossible to find from lesser-known, more ephemeral magazines. Essays on people, places, and of course food, mix here with delightful fiction to become a delectable feast. 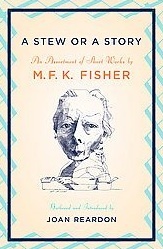 The bylines attempt to capture the contributor as “America's best-known writer on the sensuous," “Culinary Queen,” or “Food Sophisticate,” but it is impossible to categorize M. F. K. Fisher. As a writer and a woman, she was truly in a class of her own.